Have you ever asked for a referral? Did the person you asked answer with a stock response like, “let me think about it.”? Or, did she almost automatically shift her posture, and by sitting back in her chair, shifting in her seat, or crossing her arms? With the shifting movement, the person is subconsciously trying to put distance between themselves and your request. The shift indicates discomfort. Because you attempted to manufacture a referral… meaning you tried to create one that doesn’t exist. Now, you could argue that asking allows the other person to start thinking about who to refer to you. But, answer this… how often – once you ask – do they get back to you with a list of names of people who want to meet with you to learn about your service. And if they do get back to you they give you vague contact information or tell you not to use their name. 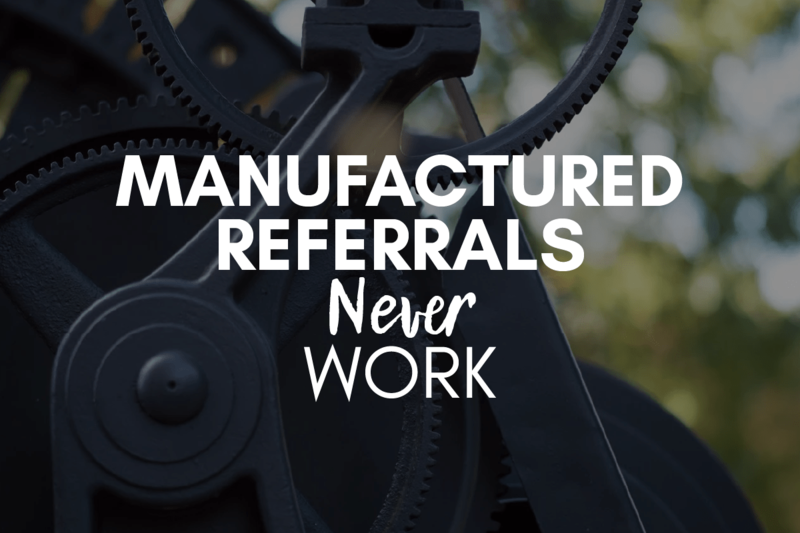 The reason for that is when you manufacture a referral – one you ask for – you are attempting to artificially create or “manufacture” a vital piece of the referral process that must occur naturally. When you attempt to artificially create this key piece you force the referral process and once forced the referral process never works the way it was intended. So, what is this vital piece of the referral process? What is it that cannot be manufactured or artificially created? It is the need, problem, or pain of the prospective client which is the reason they are open to meeting you. To put this in perspective, it is important to understand how the referral process works, specifically the mindset you need and who the players are. There are three key players in the referral process and they each play a specific role that makes the referral process work. Without any one of these three players, the process just doesn’t work, it doesn’t exist. The Referral Source: the keeper and giver of trust. The trust the referral source feels for you (as the awesome rockstar you are) is given or transferred to the prospective new client. But, that trust can’t be transformed in a vacuum. The trust the referral source has for you must be needed by the prospect. Because only when prospects have identified their need or problem to solve are they open to meeting with someone who can solve their problem. So, when a referral source tells the prospect, “I know who can help you solve that problem,” then and only then does the referral process start. A referral source can’t manufacture prospects with problems to solve for you by scrolling through contacts on his phone. Remember referrals are powerful because they are easier to close, take less work to get them to the end of the ‘yes’ (the buyer’s journey) buyer’s journey and are less price sensitive (meaning they see greater value in your service because they were referred). But, all of these reasons (and more) as to why a referral is so powerful rests on the need the prospect has. Their need is real, they have admitted they are ready to solve it, and they’d prefer for someone they know to recommend the person/company with whom they should work. This is why when you ask for a referral you eliminate the vital component in a referral. When you ask me to refer you, I have to try to come up with someone who needs what you offer. And that is really hard to do and not how most of our brains work. We are more likely to have a thought about you triggered when talking to someone who needs your service. Not the other way around. I encourage you to download my Players & Roles Cheatsheet so you have access to it whenever you need it. Now you know who the players are and their roles, let’s look at the mindset you need. “Can you tell me the catch?” she leaned in and asked. “The catch?” I asked, confused. “Yes, the catch to how you generate referrals without asking. It seems too good to be true so there has to be a catch…” her voice trailed off sounding disappointed. This question wasn’t a surprise to me – when I share that I am able to generate more than 100 referrals each year for multiple years and do it without asking for those referrals, it piques interest and questions… like this one. Here is what I explained to my new friend on understanding the referral mindset so you can generate referrals without asking. There are three parts to the referral mindset which need to inform how you think about generating referrals. Trust is King & Queen. These three parts together should inform the foundation of how you go about generating referrals. Referrals don’t just magically appear and you can build sustainability into your business if you have a process or plan in place to consistently follow to receive referrals. While you may be the beneficiary of receiving a referral, keep in mind a referral isn’t about you. Because when the referral source refers someone to you it is to help the person who has a need or problem. It just so happens you are the person to help solve their problem. (Yay for you!) I once heard that the most powerful word in the English language is “help”. When someone needs help, it triggers the very core of who we are as humans. That need to help comes from our strong desire to connect with others and to be needed. Now that doesn’t mean everyone wants to help at the same level or in the same way but for most people, when someone you know asks for help you try to help. Which means when a referral is sent to you, the referral source is trying to help a friend or colleague (and sometimes a stranger) and refers them to you. And, of course, once referred to you, they become your prospective client, prospect. So yes, bonus for you that you just received a prospective client, but don’t ever think that someone refers you because they are out there looking for clients for you. Your job is to create relationships through ongoing connections with your referral sources so you can let them know how much you care for them, appreciate them for their referrals or support and to stay top of mind. It is important to recognize that when you ask for a referral, you are asking your referral source to do work for you. Remember how I said help is one of the most powerful words in the English language? Well, it doesn’t go both ways in the referral process. To you, if may feel like asking for help but to the referral source you are asking them to do work for you by thinking through who they know who may or may not need your service. Here is an example. I’m a business coach talking to a client and uncover they need better financial help than their current CPA is providing. I recommend you (pretend you’re a CPA, if you’re not) because I trust your ability to help my client. This is the referral process at work. But this is different from you and I meeting for coffee and you asking me if anyone I know needs a new CPA. In the first scenario, I get to be the hero (the referral source always is) by addressing an issue and helping to solve it. In the second scenario, I now have to do work for you. The reason why understanding the distinction of these two scenarios is important is because you can’t manufacture or artificially create the need of the prospect or manipulate the transfer of trust from the referral source to the prospect. Have you noticed a key thread that makes a referral work? It’s the reason the prospect who was referred to you is easier to close to become a client – because they trust you. Why, when they have never met you? Because the prospect knows that for their friend or colleague (the referral source) to refer them to you, the referral source must trust you. The trust the referral source feels toward you – as the service provider – is transferred to the prospect. The prospect typically believes they were referred to you because you can solve their problem? The transfer of trust is critical for a referral to work. What makes referrals the holy grail of sales or business development is that referrals are easier to move from prospect to client. It is because of the trust that the prospects show up on the far-right side of the “know, like and trust” sales continuum, already trusting you, and ready to decide if you can help them. I’m sure you’ve figured out by now that the most important person in the referral process is the referral source – not you or the prospect referred to you. The referral source is most important because they refer the prospect to you, transfer the trust the prospect needs and gives that prospect confidence to hire you. When means you need to treat your referral sources with the upmost care. They need to know you do excellent work, they matter to you, you value them (and more than just their referrals) and you appreciate them. Building genuine and authentic relationships with your referral sources is paramount for a referral process to work and to work well. I urge you to re-consider your “asking” strategy. You need to know how to make referrals work for you by focusing on your referrals sources, strengthening your relationship with them, and continually build trust. Let’s look at a success story that will show you can generate referrals without asking. In my first year as a business and productivity coach I generated 112 referrals. And I can tell you, they didn’t just happen in my business. They didn’t happen because I am awesome (though my parents would tell you I am). When I hit 112 referrals my business was just over a year old. Read that again… only a one-year-old business and 112 people had been referred to me. My coaching practice started in September 2013 with one client. I flew the “corporate world” coup in the end of August and had one paying client. Yep that is right, one paying client. I did other consulting on the side and became an adjunct professor at a local university to have income because my income matters to our family as much as my husband’s. Just 3 months later, I had three paying clients and a few more who would be starting in January. Of the group who started in January a few were referred to me and that was the beginning of my referral explosion. Three referrals in January, four in February, five in March. Again, my referral explosion started as a trickle. By the summer of 2014 more than half of my coaching clients and trainings/presentations had come through referrals. Here I am in 2018 and the total number of referrals I have received since my business began in late 2013 is closing in on 500. More than 100 referrals in 205, 2016, and 2017. So why am I sharing these personal details about my business with you? Because I want you to know that you can grow your business through referrals… regardless of what you have to overcome. My first business – at the consulting firm – failed after a few years, forcing me back to corporate America for a job…(talk about black eye). I didn’t have a brand in town as a business coach, heck I was coming out of working a stint in HR… (no 10-year reputation of which to take advantage). While I have always given my all to my clients… in the beginning I was still figuring out how to be a coach.. (my awesomeness took time to develop – ha ha – that was a joke). And those 112 referrals didn’t come from 50 or 100 referrals sources… actually about 5 or 6 key referral sources to start and then grew to about 15. (It wouldn’t have mattered if I did have hundreds of personal friends… a dozen referral sources is my sweet spot). I also didn’t have a huge marketing budget to work with… so even if I wanted to spend a bunch of money on marketing, the dollars weren’t in my bank account to use. A referral explosion in your business is possible… but it won’t happen overnight, it won’t happen by chance and luck doesn’t need to be on your side. I’m a living and breathing example of how following a strategy and system to cultivate referrals year-in and year-out actually works. And so are my clients. When I left my “corporate” job I had already designed what a referral strategy should look like… through lessons learned from my first business failure and time spent studying successful business owners. I immediately put my system into practice in when I started and worked the system, tweaked is as necessary and reaped the benefits. (Yes, the numbers above are real!). So now it’s your turn to learn to generate referrals without asking. The first step is to sign up for the 7 Day Referral Growth Challenge. You can do this… and I’m here to help. Sign up now for the free 7 Day Challenge. I am a Beginner Ninja and I really believe your method and plan will be perfect for me. I’m getting excited about this! Hi Sally! I am so glad you took the Referral Ninja quiz! You can move yourself from Beginner to Master in no time! If you would like to know more on how to do it, just reach out to me! Thanks!! Thank you Lynda! I had a great time with the partners of the Kingdom Chamber – what a great group. And it was awesome to welcome some of them to the Growth By Referrals program!! Very excited to learn how to get referrals without asking. It has never worked for me. I am a believer in your system already. Excited to move forward in a better place with me business. Hi Risha!! Thank you so much for your comment! It makes my heart happy to know you believe you can generate referrals without asking and you are ready to move your business forward…you deserve it! I’m here to help! !